Xiaomi's intelligent reading lights include eye protection capabilities, ability to control brightness and color temperature control, making available appropriate modes for all kinds of situations, programmability and auto off, silent delay mode, high shelf life, proper design to prevent The Cooling LEDs, reasonable energy consumption, affordable prices, and remote control through Wi-Fi make the Xeeomi Yeelight smart LED reading desk an ideal choice for accompanying you during various activities. The exterior design of the study lamp is stretched and shiny, and the pure beauty of a geometric structure takes place. This lightweight and minimalist light, in addition to a bunch of moving lights, can easily fit in many corners of the house. The intelligent reading lamp consists of two main pieces. A base plus a rod and a movable handle that is mounted on the lamp. The bottom of the cylinder base is a key on the control of the lamp on the bottom and at the bottom of the base and behind the bar, the power supply socket and the input of the study light cable. Smart. The movable handle contains a 135-degree free movement bulb. The reset button is embedded in a slot under the base of the lamp and when pressed with a needle, the reading lamp will return to the factory settings. This button is used to change the network that the reading lamp is connected to. If you press the control key on the reading lamp's base once, the smart reading light will turn on or off. Double-pressing will activate the Pomodoras mode, which will be introduced later. If you rotate the control knob around, you can determine the brightness of the bulb and by holding down the control knob while turning it around, the color temperature of the reading lamp is intelligent, which will change. The four default settings in the Xiaomi smart home program are defined for reading lights, which include Pomodor mode, Study mode, Po mode, and child mode. Smart Light LEDs are designed based on real scenarios, which can be customized to suit your everyday needs. The Pomodoura name refers to the Pomodoro Time Management Technique. In this technique, work time is divided into pieces of concentration and rest. In Pomodoras, light during the focus period is perfect for your work. And after 25 minutes of continuous focus, the light changes for about 5 minutes, for example, for a relaxing and breathing rhythm to help you complete the work plan. Contributing to the idea of ​​increasing your performance and efficiency, as well as improving your eye health and preventing your physical fatigue. In the study mode, the brightness of 100 pct and the 4000 color temperature, which is somewhat neutral, is used to help the consumer in his study and increase the time spent studying to reduce the fatigue of the eyes. The blue of the tablet, the handset And the computer is harmful to human eyes. Some programs and sometimes glasses are designed to deal with this light and reduce its effect. In the Po mode, the Intelligent reading lamp uses a color temperature of 27,000 Kelvin to prevent the light from getting into your eyes while working with a computer, etc. Children's eyes are more sensitive, delicate, and more vulnerable than older ones. LED light mode The intelligent reading lamp, in accordance with the latest bio safety certificates, follows the latest safety standards so your child is not at risk and can easily paint in or do light assignments in the right light. The LEDs used in the Xiaomi Smart Light LED cover a wide range of lighting. Optical and optical design The Smart Desktop Study LED has been designed professionally to keep the consumer's eye healthy with natural light. The use of high-quality LEDs results in a homogeneous and natural light that does not excite the eyes, and the light emitted from the reading light also drops. 42 LEDs, each of which are 0.15 watts, are embedded in intelligent reading lights that give a brightness of 6 watts. It is better to use the device's own adapter to prevent damage to the power supply. The Xiaomi Smart Light LED is 300 lumens and the color separation index is 83. The ability to adjust brightness and color temperature in this study lamp is an important feature. The clear range of intelligent reading lights is from 0 to 100. The light color temperature of the reading light range is from 2700 to 6500 Kelvin. If we want to understand the color temperature, we can say that it is 2700kg and similar to a candle flame, and 6500k is a cold-like neutral, like a light on a cloudy day or a fluorescent lamp. Easily match the light to fit what you want to do. The accuracy of the brightness adjustment of the intelligent reading lamp is ± 1% and the color adjustment is equal to ± 1 Kelvin. To counteract the common problem of light beam jerk that results from low frequency and leads to fatigue, in the smart reading lamp of technology A combination of colors and an optical lens that is capable of distributing source light and turning it into a natural light, and in the light of the intelligent reading lamp, the light rays of the jump are unobserved, and the light does not have ultraviolet radiation. Set a time schedule for the Xiaomi Study Lights to turn on or off automatically at certain times. By defining a delayed shutdown mode within 15 minutes or whenever you want, this mode starts with a lot of light and gradually reduces the illumination of the reading light and the light turns off at the end of a certain period so that during this time, the light Need to collect your work or other activities. Yeelight's smart LED reading controller is the Mi site app but it's not bad to know that Yeelight has officially started working on the IFTTT. Through IFTTT, you can design applets for free to your needs-in a simple way, without the need for a deep-seated knowledge-or use existing applets that are the product of the rest. In this way, you will have many facilities and services. The Xiaomi smart home application is compatible with Android 4.0 and higher, the iPhone 4S and IOS7.0 and higher. The ability to connect to Wi-Fi in the Smart Student LED is embedded. Wi-Fi IEEE 802.11 b, g, n 2.4 GHz is included in the reading lamp to communicate with the Xiaomi home-screen home screen and its other products. The reading signal is constant and the data transmission will be carried out at that speed. 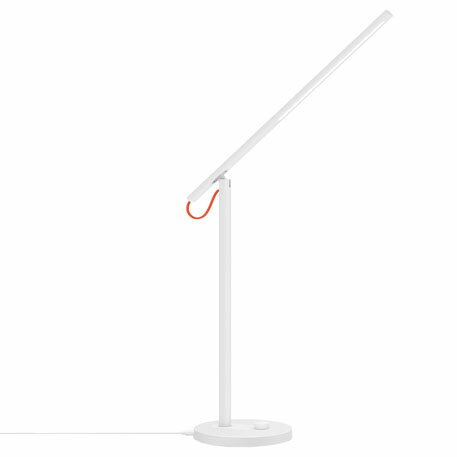 The smart study light of the Xiaomi Tablet weighs 800 grams. Its dimensions range from 44.5 to 15 by 44.5 centimeters and are white. Only 6 watts consumes energy from consumers and their working voltage is 100-240 volts with frequency of 50, 60Hz and 0.2 amp current. It has a life of 25,000 hours. The appropriate humidity for the Smart Light LED is in the range of 0 to 85% RH and the temperature is from -10 to -40 °. At the location of the lamp, the lamp is visible on the handle of the components: heat storage, heat transfer layer, printed circuit board and LED chips. Fresnel lens and light diffuser shell. The emission and discharge of heat caused by the work of the lamps to improve the performance of the LED chip and the durability and longer life of the reading lamp in general are considered in design. In different test LEDs, after 10,000 times the use of lights, the damping rate was less than 17%, and the remaining lights showed good performance. The combination of modern LED light technology with a rigorous, long-term perspective, the product of the joint design between Xiaomi and Yeelight, won the Golden Prize of IF International Design Competition among 5575 participants in 2017. Smart Desktop Study Xiaomi Yeelight is not happy with those who are eating smoke and who are more intelligent in their tasks.